Capable of charging your phones and tablets as fast as a wall outlet with plenty of power to spare. Can charge up to 4 iPhones on a single charge. TheSunJackis designed as a complete system with battery backup to provide the most powerful solar charging available on the planet. 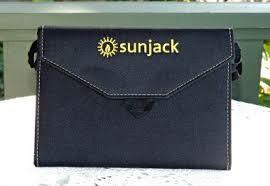 Everything is TWICE the speed of standard components � from high-efficiency solar panels that have 2 Amp USB outputs, to a cable that can carry high-speed currents, to batteries that can charge in half the time �SunJackallows you to charge all your portable devices, 24/7. Benefit from wall outlet charging speeds, anywhere. 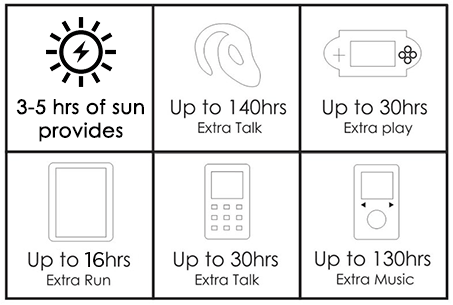 Powerful enough to fully charge most phones in 90 minutes and holds enough energy for up to 8 smartphones after just 5 hours of sunlight. For emergency power. Are you earthquake / zombie / disaster ready? Camping / Backpacking / RV / Rock climbing trips. On your car dashboard while driving. Music & Art Festivals � Coachella & Burning Man )'( anyone? Sailing / Boating / Fishing. Beaches and lounging by the pool. Rural locations such as mountain cabins, ranches, and farms. We�d like to say in space, but we haven�t tested it there � yet. Not all batteries are created equal! Our battery is optimized for fast-charging, with 2 Amps of input AND 2 Amps of output. This means less waiting around for your devices to charge. Power up and GO! Not all cables are created equal! Our cable is optimized for fast-charging, and can carry 2 amps of current. Standard USB cables only carry 1 Amp or less of current, which meansSunJackpowers you up in half the time! But you know what? At the end of the day, we�re all on the same side as a human race, and we support any company and product that promotes the development of renewable energy. Whether it�s us, or them, YOU are helping advance humanity by choosing to harness the power of sunlight!